That was the warning from Britain’s most senior car industry executive, Vauxhall/Opel boss Nick Reilly. “I think Europe will lose its competitive edge unless we move fast to catch up on electric vehicle and battery technology,” said Reilly in an interview at the Paris motor show. Reilly reckons that car makers and governments need to work more closely together to develop production-ready battery technology, before Asia and the US corners the market. 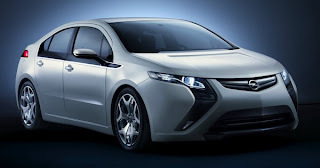 “GM, for example, has its own battery design and manufacture for the Volt, but we’re in partnership with a Korean technology company for the batteries,” said Reilly. His counterpart in China, Kevin Wale, issued a similarly stark warning in an industry speech in the UK this summer. Wale warned that the Chinese government and car firms were working in tandem to develop EVs, partly for environmental reasons, but also because electric technology offers the easiest route to catch up with western car makers. The fast Chinese work in favor of electric cars, is also for not having oil and its fleet to be increasing exponentially (currently the world's largest market). Therefore, it is a good example for countries that still squander with the burning of black gold and of our green/blue earth.